The UCSF School of Medicine has announced that Surgeon General Vice Admiral (VADM) Vivek H. Murthy, MD, MBA, will deliver the commencement address on May 15, 2017. 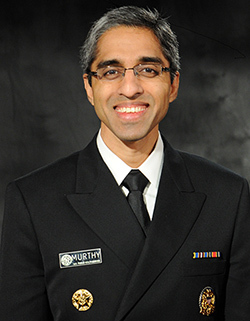 The Class of 2017 Keynote Speaker Selection Committee chose to invite Dr. Murthy because of his expertise and experience in HIV/AIDS education and community health, passion for health reform, and unique perspective on healthcare as Surgeon General. In his role, Dr. Murthy is responsible for communicating the best available scientific information to the public regarding ways to improve personal and public health. He also oversees the operations of the U.S. Public Health Service Commissioned Corps, comprised of approximately 6,700 uniformed health officers who serve in nearly 800 locations around the world to promote, protect, and advance the health and safety of our nation and our world. Dr. Murthy’s priorities have included addressing the opioid epidemic and addiction crisis, promoting emotional well-being, healthy eating, active living, chronic disease prevention and tobacco-free living. Dr. Murthy firmly believes that our nation's greatest asset has always been its people. And improving the health of the American people – and our neighbors around the world – will be Dr. Murthy’s highest priority as the U.S. Surgeon General. “I look forward to having Surgeon General Vivek Murthy join me onstage at commencement to salute the Class of 2017,” said Dean Talmadge E. King, Jr., MD. Dr. Murthy is an inspirational leader to address SOM students at a pivotal moment, as they reflect on their accomplishments and the journey ahead. Many students at UCSF are engaged in large-scale public health problems at a local, national and international level. This includes caring for San Francisco’s homeless population, advocacy on racism related to health and health care, and global health projects through UCSF Pathways to Discovery. As a physician, public health advocate and entrepreneur, Dr. Murthy brings a unique approach to his role as the 19th Surgeon General, a position informally known as the nation’s top doctor. He was nominated by President Obama in November 2013 and confirmed on December 14, 2014. The son of immigrants from India, Dr. Murthy received his bachelor’s degree from Harvard University and his MD and MBA degrees from Yale University. He completed his residency training at Brigham and Women’s Hospital and Harvard Medical School where he later joined the faculty as an internal medicine physician and instructor. In addition to clinical practice, Dr. Murthy has two decades of experience and perspective improving health in communities across the country and around the world. He co-founded and led VISIONS, an HIV/AIDS education program in India and the US; co-founded and expanded the Swasthya project, a community health partnership in rural India, to train women to be health providers and educators; and co-founded and chaired TrialNetworks, a cloud-based technology company for improving the management of clinical trials. As a research scientist, Dr. Murthy has conducted research on vaccine development and studied the participation of women and minorities in clinical trials. His research findings have been published in Science, JAMA, and Journal of the National Cancer Institute. Dr. Murthy has also served as the president of Doctors for America, a non-profit organization with more than 16,000 physicians and medical students in all 50 states who work with patients and policymakers with the goal of building a high-quality, affordable health system for all patients.